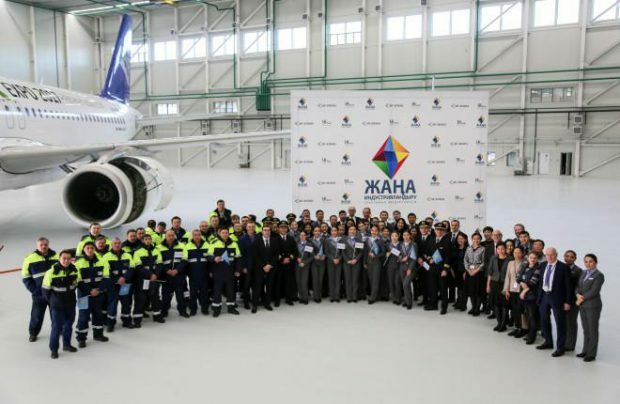 Kazakh national carrier Air Astana has inaugurated an in-house aircraft maintenance center at its base aiport Astana. The facility can provide all types of aircraft MRO services, including heavy maintenance, and will serve both the airline’s fleet and third-party airliners. The project reportedly generates 190 jobs. Air Astana told Russian Aviation Insider that the MRO hangar has a floor area of 5,500 square meters and is roomy enough to accommodate a Boeing 787, or a Boeing 767/757 and an Airbus A320/321, or two A320/A321s, or three Embraers. The first operations (modifications and preliminary checks on A320neos) are scheduled to start on December 29 this year. The center will initially start working on Air Astana’s aircraft, but hopes to expand its clientele both inside and outside Kazakhstan in the future. In 2015, Air Astana obtained an EASA Part 145 approval clearing it to perform base maintenance on Airbus A319/A320/A321, Boeing 757-200, and Embraer ERJ190 airliners. Services on the carrier’s 787s were expected to be added at a later date. Until now, the airline would rent hangar space for maintenance purposes or outsource such work to contractors abroad. The carrier is planning to open a component repair shop and add structural repair, composite repair, and NDT capacity eventually. The center will also house “the region’s largest spares pool”. The facility includes an MRO training center for college students (previously a stand-alone project established in 2015); the first candidates are already being selected for the program. The maintenance hangar was initially expected to become operational in 2015. There were plans to open a landing gear shop, avionics shop, etc. Two more hangars were also planned, but later got canceled. The hangar project was funder with a $14 million loan from the European Bank for Reconstruction and Development. Air Astana’s network comprises over 60 domestic and international routes. It operates 31 Boeing 767-300ERs, 757-200s, Embraer E190s, Airbus A320ceos, and А320neos. The airline has announced plans to become the largest A320neo operator in Central Asia and the CIS by 2020 will 17 aircraft: six A320neos, seven A321neos, and four A321neo LRs. All these airliners will be leased under contracts signed in 2015 (for 11 aircraft) and 2017 (for a further six).